Taking your time to choose the best water heater for the money can help you to save money on energy costs and have a long lasting dependable water heater. There are quite a few things to consider when you are trying to choose a system that is going to meet your needs and work nicely into your budget. A hot water heater is not something that you can take lightly. It is an important system in your home, taking the time to do the research is an important first step in having confidence in your purchase. Choosing the best water heater for your situation starts with deciding what your power source will be. In most cases your power source will already be set so you must choose from one of the above types of water heaters, unless you are considering converting from one power source to another. Each power source has its advantages and disadvantages. Electric water heaters are the most common in new construction. They are the easiest to install and the easiest to maintain. Gas water heaters are typically less expensive to run but they require venting and may not be practical for your property. Gas water heaters require a gas source either a propane tank or a natural gas source that may not be readily available in your area so before you consider converting be sure that you have a place outdoors for a tank or there is a natural gas option in your location. Solar water heaters are still relatively new and can have more expensive startup costs. For this discussion, we are going to eliminate this option from the list. While solar water heaters are a great way to save energy, at this juncture they are not typically a favored option for most people. In many cases, solar options are just not practical yet. In a few years, the technology may make them more permissible. 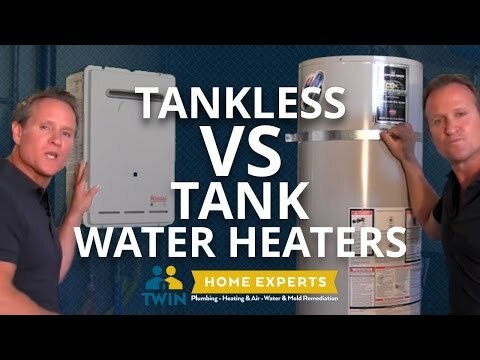 Next decision to make is whether you want to choose a tankless version or a traditional tank. Tankless water heaters are getting a lot of buzz because of the low operation costs. Tankless water heaters do not keep water at a standing temperature like traditional water heaters do. They respond to on demand water heating. In other words, the water is not heated up until you open the tap and call for the hot water. In traditional tank water heaters, the water is kept hot whether you are using it or not. Of course, keeping water hot when no one is using it can be viewed as a waste of energy but ultimately there is a benefit. With traditional water heaters, there is typically enough hot water ready for everyone in the household to use. With tankless heaters if you have a large house or several family members using the hot water there may be some wait times. The upfront costs on the tankless water heaters is more expensive. You can choose which ever type will work for your household but you do want to be sure that you take your time to consider your decision. Unfortunately, many times we are not given the chance to decide to change out our water heaters, the decision is made for us. Water heaters can go from working great to being broken down rather quickly. In some cases, there are some indication that the water heater is on its last leg. The water may not get quite as hot or may get far too hot. This is an indication that the element (the part that heats up the water) is getting ready to break. In other cases, the water heater will start to leak from the bottom. Most water heaters are sealed but the seal will wear away and the leaking will begin. In the worst-case scenario, the bottom of the water heater falls off and there is a mini flood. If you have the luxury of replacing your water heater without having to because it is faulty it is a good idea to consider doing that every decade or so. Most water heaters will last at least 10 years without any issues, after about a decade they usually start having problems. If your water heater is 10 years or older right now and you are still getting what you need from it, good for you, but you should start looking at replacement soon. It is always better to retire an appliance before it breaks down, especially when it comes to water heaters. They usually do not break down slowly and there is normally a mess that must be cleaned up when they do breakdown. Being proactive and taking the bull by the horns and replacing the heater before it kicks the bucket can help to save you some aggravation and potential property damages from the water that pours out when it does break down. Replacement is a relatively simple DIY job if you have someone that can lend a hand a few hand tools. Of course, you can always call in a pro to do the install for you but you will want to look at the top picks when it comes to water heaters so you can make sure that you are getting the best model to meet your needs. The size of the water heater does make a difference and should be a consideration. There are two size objectives that you need to consider. Capacity and actual cabinet size. For example, if you live in a mobile home or a small sized home a smaller water heater will suffice, but if you live in a multi-level home you must look at something that holds more water and that can produce more water. Size will make a difference will also make a difference when it comes to larger families. Having enough water available for everyone to get a nice hot shower largely depends on the size of the tank. As a rule of thumb, you should go with the smallest size that will accommodate your family to save on energy. Keep in mind the larger the tank the longer the water heater must run to heat up the water contained in the tank. If you are considering a gas water heater there are other room considerations that you must consider like venting and headroom to allow for proper air flow. Size also counts when it comes to fitting it in the allotted space that you have for the water heater, so keep that in mind as you browse through the reviews listed below! We looked at 5 of the top ranked water heaters. We reviewed the water heaters and listed the pros and the cons to make it easier for you to determine which model is going to fulfill your needs. This is an Energy Star-rated, 50-gallon gas water heater. It is 66.75 inches tall and 22 inches in diameter. Be sure that you consider the amount of headroom needed as well. This model comes with plenty of bells and whistles to help you manage consumption. It has electronic controls to help you manage the cycles of heating. It has two anode rods which is unusual as most only have one. There are plenty of reasons that this may be the perfect water heater for your home but there are a couple of cons! The State Premier Power Direct Vent GP6-50-YTPDT is a great choice if you are set up for gas, if not then obviously, it may not be the right choice. Converting to gas from electric typically requires professional installation. The price is a little steep but you do get what you pay for so it is a good investment. The Rheem Prestige G50-40N RH67 PD is an Energy Star-rated gas water heater is a very impressive system that really won us over. This SMART water heater is built for high altitudes which is good news for anyone that lives in a high-altitude area. The Pros on this model are impressive. This is a great innovative water heater that can really add to the safety of your family. It is smart and it is easy to use. You can access the controls from your smartphone, tablet or web browser, this can be an easy way to save on energy costs when you are away from home. Whirlpool Water Heater. Whirlpool offers a 40 gallon no frills water heater that will serve the purpose of keeping your water hot. When we say no frills, we mean, no frills. You do not get the fancy energy saving options, you do not get a lot of control options other than hotter or cooler but you do get a very affordable water heater. As a matter of fact, it is the most affordable option on this list. The moral of this short tale? Sometimes you just need to choose a water heater that you can afford right now. Six-year warranty, with this warranty against defects at this price even if the water heater kicked the can on day one of year seven you still will have gotten a lot of use out of it for a really small investment. If you need a water heater and money is tight, this is the water heater to choose. Whirlpool is a division of Sears, it is the little sister of the more expensive Kenmore and Maytag brands. It will get the job done and do it very affordably. This tankless water heater is compact so it can be mounted just about anywhere with ease. It would be a great option in the home, businesses, retail stores, restaurants, apartments, condos and even on your boat. This compact tankless water heater is small but gets the job done nicely. The 4 GPM is comparable to full size models. This is a great compact tankless water heater that is very easy to use thanks to the controls mounted right on the box. It is straight forward to install so you can save on professional installation costs. Overall this is a great water heater to reduce energy costs. The Reliance Water Heater Model 501 is an electric water heater that is built for durability. It is not built for extra features, but it will stand up to years of use without a problem. While Reliance has gotten some negative buzz for their gas water heater valve issues, the electric models have been considered a valued investment for the price. This model is a trusted model that will stand up to years of use. It would be a good option for any home. it is easy to install and easy to operate. You pretty much connect two water lines and plug it in and you are done. These 5 water heaters are just a small sampling of the water heaters that are available we chose them to help people of all budgets to be able to make a purchase with confidence. You do want to keep in mind that if you can afford it you should buy a higher end option because it is something that you will be using just about every single day. Investing in a model that is a little priceyer will likely wind up being a model that will last you a longer and provide you with the reliable service for years to come. Of course, you can only do what you can, if you need a water heater and your budget is tight we included two options that will meet your needs nicely. The goal is to have hot water, you can do that with a $300 heater or a $1000 heater but the operation cost also should be considered. Typically paying a bit more now when you are investing in the heater will pay you back over the years by reducing your energy costs. Cheaper models typically are more expensive to run, so one way or another you will wind up paying! If you invest more you will pay less over the years and you will likely not have to reinvest too soon in another water heater. You can rely on any one of the heaters listed here to provide you with what you need at a price you can afford.